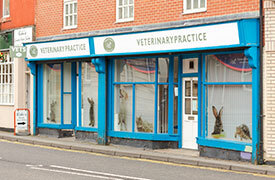 Consultations by appointment only, Vaccinations, neutering, dentistry and other procedures. For any further information please do not hesitate to contact us. Furthermore, you can book an appointment by clicking here. *Surgery is open from 8:30am - 12:30pm, but consultations are available from 9:00am - 10:00am. We have been in these premises in Ashington since 1965. The surgery was extended and completely refurbished in 2008, it now has two consulting rooms, an operating theatre, kennelling for day patients, pet supplies area, x-ray, laboratory and dental facilities. Parking is available either on Station Road itself or in the car park behind the surgery. 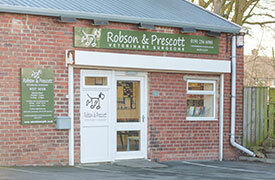 Please contact us if you require an appointment, or assistance in sourcing any pet product. Furthermore, you can book an appointment by clicking here. This branch was converted from 'The Gardeners Arms' in 1968. 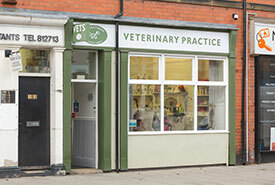 More recently we added a pet supplies shop adjacent to the surgery. Our receptionists Wendy Ridley and Viv Fensome are happy to give advice, or source any pet shop product that we do not have in stock. At this branch we offer clients consultations, vaccinations, medication checks and very minor procedures. 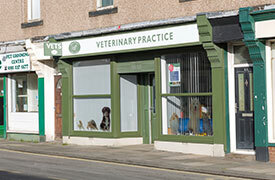 If your pet requires an operation or a longer appointment, please contact either out Blyth or Whorral Bank branch. For any further information please do not hesitate to contact us. Furthermore, you can book an appointment by clicking here. This branch was newly built in 2005. We demolished an old shop leaving only the shop front and put up purpose built premises. We have two operating theatres, three consulting rooms, kennelling for hospitalised animals, x-ray and dental facilities. There is a well equipped laboratory to do in house testing. This will enable clients in this area to have their pet treated for most conditions without having to travel to our main branch in Morpeth. We have recently added a pet supplies area to the waiting room, our receptionist Patsy Walker can help source any product we may not already have in stock. Access to the surgery is either from Bridge Street, or directly from the car park behind Bridge Street. Consultations are by appointment only. For any further information please do not hesitate to contact us. Furthermore, you can book an appointment by clicking here. After the relocation of our main branch from Staithes Lane to Whorral Bank in July 2012 we decided to open a small branch opposite the old site for the convenience of our clients in Morpeth town centre. 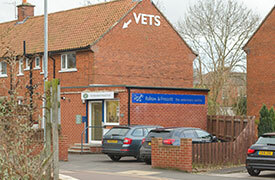 A garage attached to one of our Vets houses was extended and converted into a small surgery with a waiting room, one consulting room and we even managed to add a small pet supplies area. At this branch we offer consultations, vaccinations, medication checks and very minor procedures. 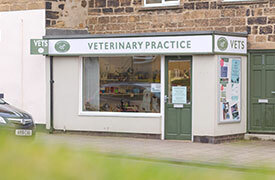 If your pet requires an operation they will need to go to our state of the art new surgery at Whorral Bank. If any of our clients have difficulty with transport up the bank, we can arrange for your pet to be collected and transported in our animal ambulance. 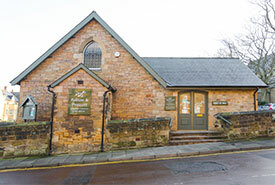 Our Seaton Delaval surgery has a reception area and two consulting rooms. We have a nurse on duty at this branch who is available for dressing changes, nail clipping, weight check and wound check appointments. If your pet needs an operation we have operating facilities available at our Whorral Bank main branch in Morpeth, or at our Blyth branch. 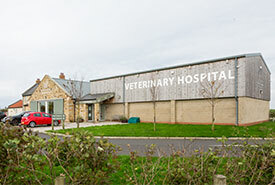 You can make your pets post-operative care appointments at Seaton Delaval. Our receptionists Linda Mead and Lesley Robertson are happy assist with any queries you may have. Offers consultations, vaccinations, medication checks and has operating facilities. We also offer a free ambulance service during normal hours to and from our Whorral Bank Hospital. For any further information please do not hesitate to contact us. Furthermore, you can book an appointment by clicking here.